Aeration and filtration be damned! The most important attribute of any wine or liquor decanter is that it looks as dashing as Gosling, as unique as Buscemi, or as badass as The Rock sitting on your bar. Hey, I just had an idea for a line of celebrity decanters. At their origin, decanters are decorative vessels. That oenophiles say they help filter out sediment from wine, and improve or expand its flavor through oxidation (exposure to oxygen, also called "opening up") isn't complete BS, it's just not the historical reason the practice began. A couple thousand years ago, wine was stored in earthenware, bronze, silver, or gold because...that's what they had to store their wine in. During the Renaissance in Italy, when Venetian glass became an art form, the trend of storing wine and liquor in glass vessels grew in popularity. Then in the 17th century it became customary to pour wine from its original bottle into a second container before serving it. All of this, though, revolved around the aesthetics of "decanter" container rather than the act of decanting and changing the wine's aromas and flavors. As for decanting whiskey and spirits, both then and now, it's unnecessary, and has very little physical effect on the liquid. Hard liquor doesn't have the tannins wine does, so you don't need to expose them to oxygen for mellowing. Hard liquor also has a significantly higher alcohol content than wine, so the potential for a chemical reaction from oxidation is almost non-existent over the course of an hour or two. Even if you are decanting with good reason and true purpose, the visuals of the process, and the placing of the decanter on your bar, dining table, or desk at 5 p.m. on a Friday, are at least as appealing as the results. So why go for a boring old pitcher or jug or, worse, the bottle the booze came in when you can make a statement with one of these unique creations? Here are my picks for the coolest wine and liquor decanters. Note: Decanter prices are approximate and listed as they were at printing. Prices are subject to change. A stormtrooper who's packing nothing but Jameson is my kind of stormtrooper. I bet in whiskey decanter form he can even pull off a decent shot. This booze-ready Empire lackey has been poured from the original stormtrooper helmet mold Andrew Ainsworth designed for Episode IV in 1976. Decanters may be in the miniature, but they maintain movie-accurate proportions and details. Drunk on love. A "hearty" Cabernet. Forget wine cellars, how about wine chambers (four of them to be exact)? Etienne Meneau's blown glass series of decanters, entitled "The Strange Carafes", culminates in this borderline macabre receptacle and purveyor of wine, the Grand Coeur, or Big Heart. 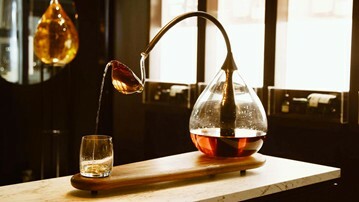 Interpretive valves extend and curve asymmetrically from the carafe's base into a shape that is identifiable as our mammalian epicenter without being uninterestingly literal. The valves converge at a wider pouring spout, pitched forward in a come-hither pose that calls out to the world's finest bottles of aged grapes, Estate Reserves, and Kappa Kappa Gammas. Oh, Ferdinand, what have you gotten yourself into into yourself this time? Rather than weighing 1,000 pounds this charging bull fills up with 1,000mL of your favorite spirit. The Atlas decanter has it even worse than the Atlas of Greek mythology. The latter may have been cursed with the task of holding up the skies for eternity, but this one has to carry the weight of the world and my scotch. I should be a pal and lighten up his load for him. Pours is so sure it's the most excellent wine and spirits decanter you'll ever use that it doesn't even wait until after it pours your glass of Bordeaux or whiskey to take a bow. It just incorporates the gesture into its work. Developed by British design and engineering firm Harvey & John, the Pours decanter bows down to serve partakers whatever fine wine or spirit they've added to its glass reservoir. Even more impressive, the decanter's ladled stem moves automatically when it senses a glass set on the end of its wood pedestal. Need a gift for a man? Even if he doesn't drink whiskey - hell, even if he drinks only Kool-Aid - I think this 5-piece set of Everest glasses and decanter is a jaw-dropper for display. The liquid amber of an 18-year single malt captivates amidst the decanter's ultra-clarity glass nubs and undulations, and I say the effect could be even more dazzling if the tumblers were filled from one stocked with Purplesaurus Rex. The snake wouldn't have had to ask my wife twice if he'd looked like this. Riedel knows wine's temptation, its charm, its desirability. The power it has over women (and, sure, some men too). And in response (or maybe just because they look damn cool) they've created this series of snakelike crystal decanters. The tallest is even called the Eve. Adonis Designs does a nice modern, industrial take on the decanter. All rectangles and squares, the pieces look like some of the houses I see in my neighborhood. The ones with a party going on inside. The decanters accept any standard size liquor bottle, inverted and positioned on top of the slate canister. A switch on the side depresses to release the internal valve, and let the good times flow.